Kees Bol was born in 1916 in Oegstgeest, as the eldest son of a bulb grower. In 1935 he moved to Eindhoven where he joined the Philips Company in 1940. In 1941 he married Catharina (Toos) van ‘t Hof. From this marriage four children were born. At Philips, he met the artist Frans Uijen, who inspired him to start painting. It was thanks to Dr. Ir. Frits Philips (the industrialist) that he was able to take art classes. Bol was taught by Jan Heesters in Schijndel and Paul Citroen, Henk Meijer and Han van Dam in The Hague. In 1946 Kees Bol established himself as a full-time artist in Eindhoven. In 1950 he received the Therese of Duyl-Schwartze prize for a portrait of his wife Toos. During this period, he also enjoyed his first solo exhibitions, among others at the Van Abbemuseum in Eindhoven (1955) and Museum De Lakenhal in Leiden (1957). From 1951 to 1972 Kees Bol taught at the Academy of Industrial Design in Eindhoven (now the Design Academy). In 1963 he was appointed as a lecturer at the Royal Academy of Arts in The Hague. Also, in those years, he was an active board member of various cultural organizations. From the late ’60-ties onwards Kees Bol spent several months a year in the southern French town of Rouveret. In 1970 he moved to the fortified town of Heusden. The French and Dutch surroundings proved to be an inexhaustible source of inspiration for his landscapes. In Heusden he, together with his wife Toos, acquired a listed house which was built in 1605. There in his studio, Bol painted many a portrait and still life. In 1976, the Van Abbemuseum in Eindhoven organized an exhibition in honour of his sixtieth birthday. 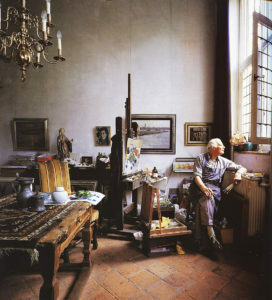 Numerous exhibitions followed in art galleries, including in The Hague and Eindhoven, and from 1990 onwards his work was shown exclusively in “The Blaauw Laaken Kunstkabinet” in Heusden. In 1996 the Noordbrabants Museum in ‘s-Hertogenbosch organized, in honour of his eightieth birthday, a retrospective of his work. In 1982 Kees Bol was appointed Knight in the Order of Orange-Nassau and in 1991 he received the King’s Commissioner medal of the province of Noord Brabant. In addition in 2007 a bust was unveiled in the park, located at his former home address at the Rustenburgstraat 33 in Eindhoven. In the presence of the artist, his family and friends the park was renamed Kees Bol. Kees Bol died on 18 September 2009. The funeral service was held at the Catharijne church in Heusden on the day he would have celebrated his 93rd birthday.